Director/Writer: Jose Larraz / Cast: Kathleen Patane, Greg Rhodes, Liz Hitchler, Jerry Kernion, Mark Irish, Clark Tufts, Claudia Franjul, William Russell, Jennifer Delora. 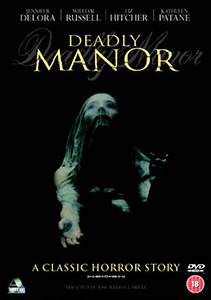 Six teenagers embarking on a camping trip stop to pick up a hitchhiker who informs them they are off course and, when a heavy rainstorm sets in, they take shelter in a remote manor house that appears to abandoned. Closer inspection reveals that yesterday’s paper has been left out and the wreck of a car has been mounted in the garden. As night falls and the group wander aimlessly around the house, they are killed by an off-screen figure who might well have some answers concerning all the black and white photos of the same solemn woman that adorn every wall in the joint. This clunky rarity is best viewed tongue-in-cheek as you will find it impossible to take lines like ‘a horn doesn’t just beep by itself’ seriously. Nearly a solid hour of crappy dialogue torments until the butcherin’ starts (bar an off-camera taster earlier on). Though shot in ’89, the film has not aged well and could easily be mistaken for something some ten years older, emphasised by the characters’ total lack of sense. The girls all say things like ‘maybe we shouldn’t be here’ and the boys reply ‘chill out, babe, there’s nothing here that can hurt us…’ Asking for it. Allowably, there are a couple of creepy shots thrown in amongst the junk, but when the killer’s opening gambit to the final girl is a perky; ‘yes, it’s me!’ before even removing their mask, one must wonder who the script was approved by. When the heroine replies: ‘you’re insane – you’ve created all this madness in your head!’ you get your answer.